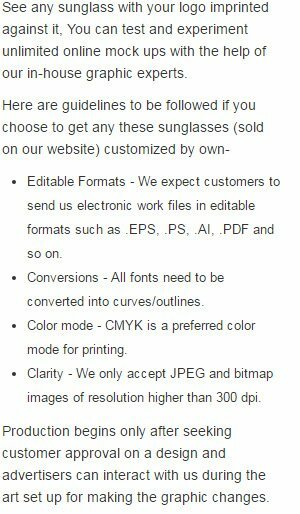 Why are marketers going crazy about promotional printed peace neon sunglasses? Because they know it is going to be a major hit and people are gonna recognize them easily. Logo imprinted promotional peace neon sunglasses are the popular giveaway during promotional events and marketers are handing them as a greeting token. Joyfully imprinted peace neon sunglasses make a great gifting token during weddings and other family events, too. We offer huge discounts on bulk orders of these printed peace neon sunglasses. Request a quote to know about the savings that you can make on bulk orders of this promotional printed peace neon sunglasses. Imprint area - 2" X 1/4". Imprint Area : 2" X 1/4"